On banana or apple slices and carrot or celery sticks. Mixed with ricotta cheese and honey served on a rice cake. Mixed with chocolate nibs and raspberry jam on top of a rice cake or hearty piece of toast. Spread on a toasted whole wheat English muffin and topped with strawberry slices. Added to a banana and/or strawberry smoothies. Mixed with your favorite low-fat yogurt and some flax seeds and used as a tasty fruit dip. 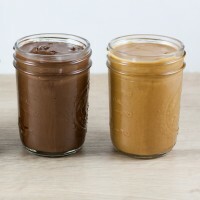 Added to a chocolate banana shake – mix 1 cup chocolate milk, chocolate almond milk or chocolate soy milk with 1 Tbsp of peanut butter and 1 frozen banana. Along with mashed bananas added to your pancake batter for a delicious new twist! Mixed into yogurt with some granola for a great healthy dessert. Added to oat bars with bananas, honey, and your choice of nuts and seeds or dried fruits. Mixed with soy sauce and agave for a dip served with pressed cooked tofu or summer or spring rolls. On a spoon, especially when it’s chocolate peanut butter! I just make sure to close the lid after one scoop because it’s hard to stop! Although I do occasionally enjoy snacking, I rarely eat in between meals . But there are days I need to have a snack if meal time is going to be extensively delayed. Here’s 50 Healthy and Kid friendly snacks and 30, 100 Calorie Snack ideas! « Avoid an Exercise Rut: Vary Your Workouts!